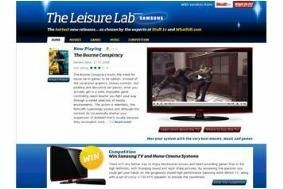 Check out The Leisure Lab and you could win a Samsung 40in LCD TV or Blu-ray player | What Hi-Fi? And while you're there, check out the latest movie, music and games reviews. The site's just had a major revamp, with a new dedicated music channel, and will now be updated daily, rather than weekly. This weekend we've got reviews of Brian dePalma's controversial Iraq film, Redacted, and the Spanish chiller, The Orphanage, plus podcasts with our verdict on the latest albums from Nine Inch Nails and CSS. Fancy something with a bit more action? Then the gamers among you might want to check out our reviews of The Bourne Conspiracy and Guitar Hero: Aerosmith. There's plenty more to come in the next few weeks, including Battlefield Bad Company and Ferrari Challenge. And for the movie buffs we'll be bringing you reviews of Vantage Point and Son of Rambow. So head on over to www.theleisurelab.co.uk and discover the best Blu-ray, DVD and CD discs to test your system to the max.